Blocking with the feet has the great advantage of leaving the hands free. However, it does leave one momentarily on one leg and so the balance must be very secure. Here are two of the most common defensive uses of the feet. Nami-ashi (inside snap block). Although this technique may be executed from any one of a number of stances, including the forward and diagonal straddle stance, it is best practised basically from the straddle stance. From this stance, simply kick the sole of the foot inward and upward in front of the body, using the hip muscles to give the movement its snap. This is a very fast technique: only the blocking leg is moved and the body weight should not be shifted. 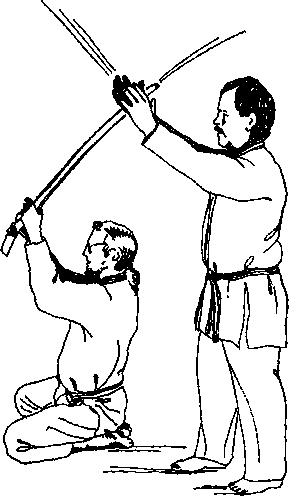 It is useful either to parry an attack to the groin or to move a leg out of range of a stamping kick.